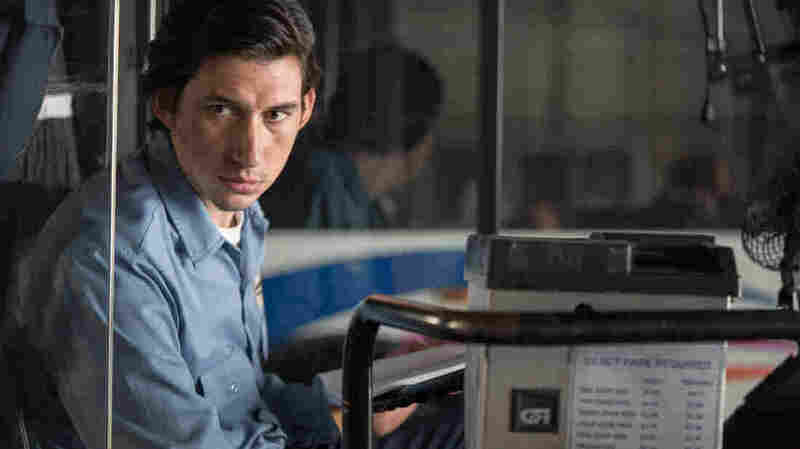 'Paterson': A Love Poem To Poetry, From Director Jim Jarmusch Paterson's main character is a bus driver who writes poetry on his lunch breaks. It was inspired, in part, by an epic William Carlos Williams poem. In Paterson, Adam Driver's character does the same thing every day. "Routine is very liberating and nurturing for him," says director Jim Jarmusch. Cities are almost like characters in the films of director Jim Jarmusch — think of New Orleans in 1986's Down By Law, or Memphis in 1989's Mystery Train. In his latest film, Paterson, Jarmusch takes that idea one step further. The film takes its name from three things: its setting, Paterson, N.J.; its main character, a bus driver named Paterson; and William Carlos Williams' epic poem "Paterson," one of Jarmusch's inspirations. Paterson unfolds like the stanzas of a poem. Every morning, the main character (Adam Driver) wakes up and goes to work. He drives a bus around the New Jersey city that shares his name and writes in his notebook on his lunch break. At night, he comes home to his wife, Laura (Golshifteh Farahani), then walks the dog and stops by the local bar for a beer. He does the same thing every day. "Routine is very liberating and nurturing for him," Jarmusch says. "To be a poet and to drift around and observe small things, overhear conversations, you know, whatever strikes him." Jarmusch says he got the idea for the script more than 20 years ago on a trip to Paterson, where one of his favorite poets set one of his most famous poems. William Carlos Williams worked as a pediatrician in nearby Rutherford, N.J., and much of his work draws on the lives of his working-class patients. "The beginning of the poem 'Paterson' has a metaphor of a man being the town, and the town being a man," Jarmusch says. "And I took something from that — a small idea of maybe someday I'd make a film about a man named Paterson, who lives in Paterson, is a poet and like a working-class guy." There are other ways that Williams is woven into the film. One of his business cards is tacked up behind the bar that the main character frequents, and there's this line from the poem "Paterson": "no ideas but in things". That line turns up in the movie spoken by a rapper practicing his craft in a laundromat. The phrase became a sort of mantra for some 20th-century poets who focused less on big abstractions and more on specific objects and images. "That dictum has always kind of been in the back of my head when it comes to writing," says poet Ron Padgett, an adviser on the film. Padgett also contributed poems to the movie, though he didn't want to at first. I still think poets are like, for me, like rock stars. They're kind of magical people. They should just be given whatever they want. "It was a very slow seduction," Padgett says. "And [Jarmusch] said, 'You know, if you — you don't have to do this, but if you'd like to — if you want to write anything special for the movie?' I said, 'No, no, no. Too much pressure. I can't handle it.' And as soon as we hung up, I started thinking, Why not take the challenge?" Poetry has turned up in Jarmusch's films before — Dead Man (1995) is about a character named William Blake and Down by Law has a joke about Robert Frost. Jarmusch even wrote a poem of his own for Paterson. He says he's been an avid reader of poetry since high school. "These people are like innovators and rebels. They deal with changing your consciousness. Their form is not a commercial one. Show me a poet that does it for the money, you know? I still think poets are like, for me, like rock stars. They're kind of magical people. They should just be given whatever they want." Maybe Jarmusch can't give poets everything they want, but Paterson is his own love poem to their work.